Naftali was the youngest of nine children born to devout Hasidic Jewish parents living in Kolbuszowa. In the Hasidic tradition, he wore a long black coat and shoulder-length earlocks. He first faced antisemitism in the second grade when his teacher cut one earlock off each Jewish boy. Naftali escaped the teacher's shears, and his father, a respected merchant, had the teacher suspended. 1933-39: On September 9, 1939, the German army invaded Naftali's town and decisively defeated a small contingent of poorly equipped Polish cavalry soldiers. 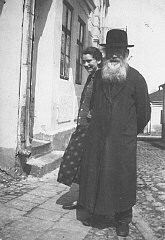 The Jews were rounded up; they watched as the Germans burned and looted their homes. Over the next two weeks, Naftali helped to bury dead horses and clean up the debris and unspent shells from town. The Germans hung two Jews in the town square as a reminder to them all not to resist their demands. 1940-44: Two shots rang and Naftali heard his father scream, "Revenge, take revenge!" Five more shots, then silence. 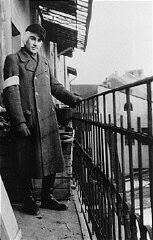 Families of the 22 men the Gestapo killed that day came to the Jewish cemetery outside the ghetto and wrapped the bodies in shrouds and prayer shawls, according to Jewish custom. Naftali and his brother Liebush buried their father next to his father, who died 23 years before nearly to the day. At home, Naftali took the candle his father had made from scraps of wax to light to commemorate his own father's death, and lit it for both. 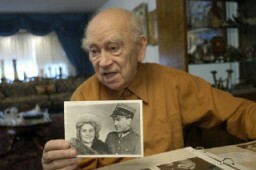 Naftali lived in the woods as a partisan before liberation by Soviet troops in mid-1944. 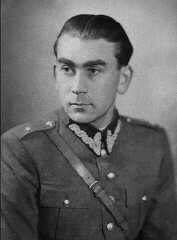 He joined the Polish army, helping to liberate Cracow. He immigrated to the United States in 1947. 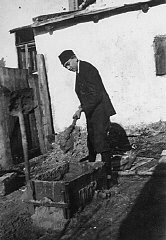 Photo A young Jewish man, Naftali Saleschutz, in the Tarnow ghetto.